Warm spirals of fluffy, moist, melt-in-your-mouth dough layered with a fragrant blend of cinnamon, sugar and butter, all smothered in a luscious glaze that spills over the tender sides and covers your fingers in sticky sweetness. I’m pretty sure that’s what Heaven is made out of. 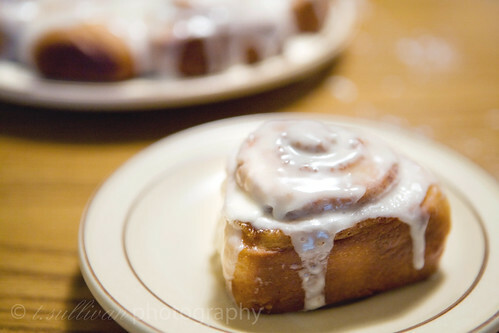 There is only one thing you need to know about these cinnamon buns, and that is that they are they best cinnamon buns ever made in the history of mankind. If you’ve only ever had the kind of cinnamon buns that come out of a can, these will knock your socks off. Don’t let the recipe scare you either. It really couldn’t be easier! I’ll let you in on a little secret: For as much as I bake, I’ve never baked with yeast before. Not once. And yet I didn’t have a bit of trouble with this recipe. In fact, the hardest part of this recipe was the waiting – waiting for the dough to rise, waiting to eat the buns so that they’re not lava-hot, waiting to let other people have one before I dive in for seconds, etc. If you’re looking for a special breakfast treat to make for holiday guests, you must put these cinnamon buns on your list. Before you faint when you see how much butter is in this recipe, keep in mind that it makes TWO batches of rolls and that you (probably) won’t be eating every single roll in the batch. Don’t bother halving this recipe. You can freeze half the dough for at least a week, probably longer – and believe me, you’re going to want to make that second batch! If you plan to make the second batch later, only use half the ingredient amounts for the filling and glaze listed below. Make ahead: Combine milk, 1/2 cup sugar and oil in a large pot over medium heat. Heat, stirring to dissolve sugar, until just before boiling. Remove from heat and set aside to cool for about an hour or until lukewarm (between 105° – 115°F; use a thermometer to check). Sprinkle the yeast into the warm milk mixture and allow to sit for a few minutes. Add 4 cups of flour and stir together until a sticky dough forms. Cover loosely with a kitchen towel and let rise somewhere warm for about an hour. In a small bowl, whisk together remaining &frac12; cup of flour, baking powder, baking soda, and salt. Add to dough and combine thoroughly to form an elastic dough. Spray the inside of a large bowl with cooking spray. Put dough in the bowl, cover tightly, and store in the refrigerator overnight, or up to a day. Assembly: Spray a 9-inch round cake pan with cooking spray. Generously flour a clean, dry surface. Place half the dough on the floured surface and using a rolling pin, roll out into a large rectangle. Gently spread &frac34; cup of softened butter over the dough with a butter knife. Sprinkle 2 tablespoons of cinnamon and 1/2 cup of brown sugar over the buttered dough. Add any raisins, nuts or other fillings. Starting on the longer side of the rectangle, roll dough in a tight spiral toward the other end and pinch the seam shut. Slide a strand of dental floss under the rolled dough 1-1&frac12; inches from the end. Cross the ends of the floss over the top of the roll and pull in opposite directions, slicing off a section of dough. Repeat with the rest of the dough, placing buns in the prepared pan. You will have space between the buns. Set aside to rise for 30-45 minutes. Bake in 350°F oven for 15-18 minutes, or until lightly browned on top. Top warm buns with glaze. Serve warm. Don’t forget to share! Is 305 really the correct temp or is it supposed to be 350? I only ask b/c it’s an unusual temp. These look SO good…can’t wait to bake them! Oh my, can life get any better than this? Sweet sticky buns and a cup of coffee. I dare anyone to be in a bad mood after this. Just looking at your gorgeous pictures and my mood is brighter. :) Thanks so much for this post! P.S. 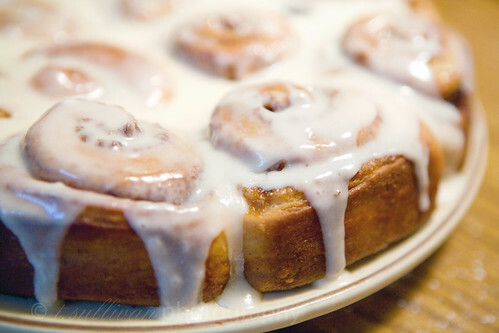 Your photos of the cinnamon buns couldn’t be more appealing. They really look SENSATIONALLY yummy! Beautiful! When you roll out the dough to form the rectangle, how thick is the dough? How big is the rectangle? Thank you for a great recipe. I can’t wait!